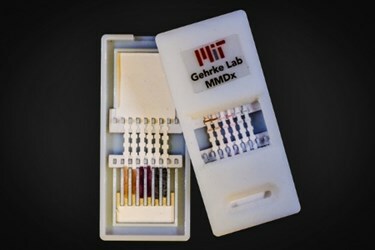 Using multicolored silver nanoparticles, a team from the Massachusetts Institute of Technology (MIT) recently developed a diagnostic device that can simultaneously test for several hemorrhagic fevers. The multiplexed design was developed to provide point-of-care (POC) screening for Ebola, yellow fever, and dengue fever, helping identify infected patients for treatment and isolation quickly. The West African Ebola outbreak is approaching the one-year milestone since he first cases were reported. Some semblance of control over the disease’s spread has been achieved, and with this comes time for reflection on lessons learned. At the height of the epidemic, when the disease was rapidly gaining momentum, the absence of a rapid POC diagnostic was identified as a critical gap in how caregivers responded to the disease. Several teams kicked of development efforts to rectify this shortcoming, and their efforts are now coming to fruition. While Ebola was a primary focus for the new diagnostic test from MIT researchers, other diseases with similar deadly potential were also included in the design, according to a recent story from MIT News. Based on a simple paper test strip, the device was designed to perform like a home pregnancy test, giving results while the patient waits. A lateral flow technology, like that used in pregnancy tests, makes the new diagnostic possible, but for the first time the lateral flow technology was used to study multiple diseases at once. Existing tests are time consuming, must be performed in a high-tech laboratory setting, and can take days to complete. The new device takes only about 10 minutes to render a diagnosis and, using a single specimen from the patient, will simultaneously test for yellow fever, dengue fever, and Ebola, according to a recent study published by the team in Lab on a Chip. The device uses multicolored silver nanoparticles that provide a colorimetric indication when a disease is present. No external excitation source or other chemicals are required for a diagnosis to be made. The nanoparticles are triangular and provide the various colors based on their size. “When we run a patient sample through the strip, if you see an orange band you know they have yellow fever, if it shows up as a red band you know they have Ebola, and if it shows up green then we know that they have dengue,” Kimberly Hamad-Schifferli, a visiting scientist in MIT’s Department of Mechanical Engineering and a member of the technical staff at MIT’s Lincoln Laboratory, said in the MIT News story. Each size nanoparticle gains its specificity to disease from antibodies that are attached to their surfaces. When the specimen flows along the test strip, it interacts with the antibodies attached to the nanoparticles. If the antibody detects the disease it is specific for, it grabs onto the virus, making the nanoparticle visible in the designated color range. While the rapid diagnosis of deadly diseases like Ebola, yellow fever, and dengue fever is a critical capability required by healthcare workers today, new treatment options are also being explored. Recently, an Ebola patient was successfully treated with an experimental blood filtration device from Aethlon, which may indicate a future direction for patient care. Another treatment approach involves pathogen inactivation in convalescent blood plasma, a technique pioneered by Cerus, whose CEO spoke with Med Device Online about it earlier this year.